14 Jan Collect a 4⭐ Magus Convict GUARANTEED in the Lord of Light! Conquer the Lord of Light to earn Convict AND Lilith Soul Fragments! Earn Convict Soul Fragments in the Lord of Light Dungeons from January 14th to January 17th at 4pm PT! Each Lord of Light battle has a chance of dropping 5, 10 or if you’re lucky, 50 fragments! Collect 200 Fragments and you can redeem them in the Book of Souls’ Fragments screen for your very own 4⭐Magus Convict. Using the jagged end of a broken bottle and various contraband as her weapon, the Magus convict is a single-target magic damage dealer that grants immunity to Silence and Crave effects for her team with her passive while inflicting Fear on her basic attack. Her power skill can remove Revenge and Counterstrike effects from all enemies with a chance to gain those effects for herself and grant Regen to all her allies. SPECIAL EVENT ADDITION: Trade extra Convict Fragments for new Tower Talismans! Tower Talismans are exclusively available in the Specials Store in exchange for Convict Fragments. 500 Convict Soul Fragments will get you 1 Tower Talisman! Tower Talismans are green talismans with a 3 set effect that is not available anywhere else! Equip them to gain a random Golden Defensive Effect every turn for 1 turn. We’ve placed a free pack of 10 Convict Soul Fragments in the Store to get you started! 🎉Collect Lilith Soul Fragments! 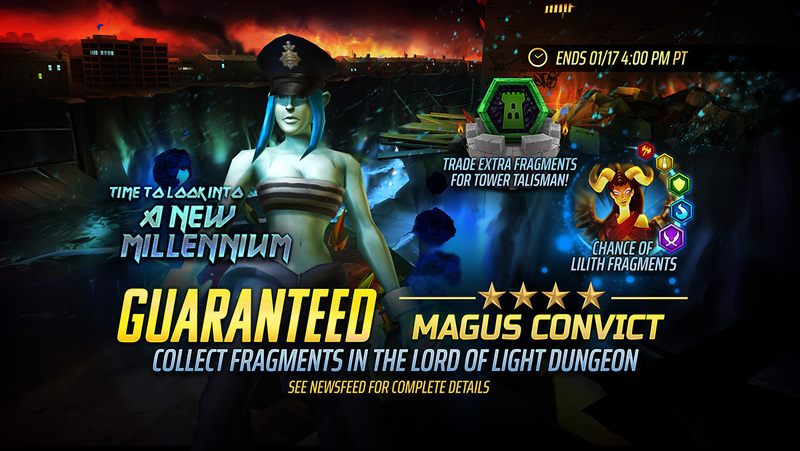 These special Fragments have a chance of dropping from all floors of the Lord of Light dungeons during this week’s Magus Convict event! Lilith Soul Fragments are a recurring fragment that is periodically featured in events. You may need to collected these fragments over multiple events in order to have enough to redeem a soul.